Build on What You Know The Crusades you read about in Lesson 2 began the decline of feudalism in Europe. In Lesson 3, you will learn about a series of crises—including the plague that you read about in the opening story—that further weakened feudalism in Europe. Before the end of the century, the plague had killed tens of millions of people in Europe, North Africa, and western Asia. In Europe, about one-third of the total population was killed. Spread of the Disease The plague that struck western Eurasia in the mid-1300s is called bubonic plague bubonic plague. Its victims experienced severe chills, fever, convulsions, and vomiting. Victims also developed dark spots on their skin and swollen glands. A person infected with the bubonic plague was usually dead within a few days. The plague of the 1300s became known as the Black Death. Global Impact of the Plague The massive loss of life caused by the plague had a major impact on Asia, North Africa, and Europe. Christians and Muslims reacted differently to the plague. Christians often saw the plague as a punishment for sin. By comparison, Muslims saw the plague as testing their faith in God. Regardless of their faith, the plague had killed 20 to 30 million people by 1400. For a short time, wars stopped and trade declined. Some landowners were ruined by a shortage of labor. However, this was followed by economic recovery for some people. For example, European workers were so scarce that those able to work could demand higher pay for their labor. The shortage of labor and higher wages weakened feudalism because workers began to migrate in search of higher wages. In Europe, the hostility toward Jews that developed during the Crusades continued during the bubonic plague. Jews were often accused of causing the plague by poisoning water wells. They were driven out of many German towns during the plague. ESSENTIAL QUESTION 3 How did disease affect the world in the 1300s? The leprocybubonicchicken poxflu plague killed tens of millions of people. How did the plague affect the size of Europe’s population? Europe lost about 10 percentone halfthree fourthsone third of its population to the plague. 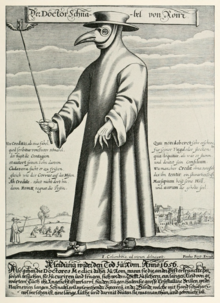 In the 1300s, England and France faced not only the plague but frequent warfare as well. Between 1337 and 1453, England and France fought each other in the Hundred Years’ War. It was actually a series of wars—not one continuous battle. Click on the image to see more about the 100 years war. Background for the War William, Duke of Normandy, was from the Norman region of France. He claimed to be the rightful king of England. In 1066, William captured England in what is called the Norman invasion. He became known as William the Conqueror and tied the nobility of France with the nobility of England. Over the years, tensions grew over who had the right to rule either region. The Hundred Years War was actually a of wars—not one continuous battle. Click on the picture to learn more about Joan of Arc. Years of Battle Those tensions reached a crisis point in the early 1300s. England claimed territory in the southwest of France. France was supporting Scotland’s fight against England. There was also debate about rights to sea travel in the English Channel. Fighting began when the king of France tried to take the territory claimed by England in southern France. The English king responded by claiming that he was the rightful king of France. In 1337, England attacked France. The English had several victories. In 1428, the English attacked Orleans, one of France’s last major strongholds. A French peasant girl known as Joan of Arc Joan of Arc led the French to victory. By 1453, the French had driven the English from France and ended the war. New Weapons New weapons changed warfare in Europe and around the world. 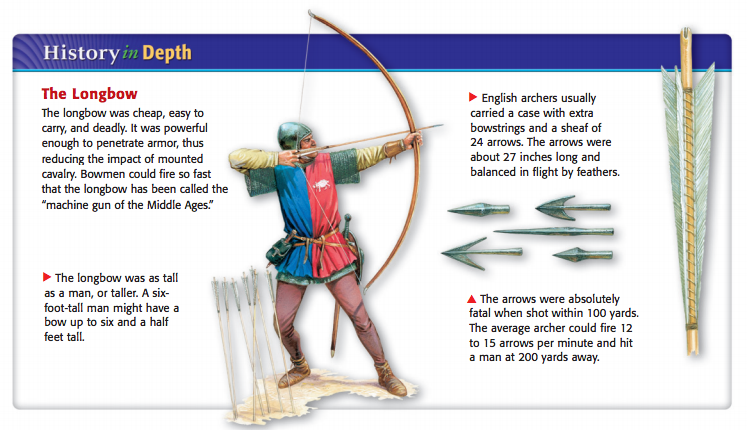 A longbow shot arrows that could penetrate a knight’s armor. Europeans also took advantage of new gunpowder weapons. Gunpowder technology came from China, but Europeans developed the technology into a major instrument of war. The longbow and gunpowder weapons could easily defeat knights. Over the next 300 years, the development of gunpowder weapons would greatly change the intensity and organization of warfare. ESSENTIAL QUESTION 2 Who fought in the Hundred Years’ War? What new weapons were used in the Hundred Years’ War? For centuries, many European societies followed the feudal structure you learned about in Chapter 9. Over time, however, European feudalism broke down and signaled the end of the Middle Ages. Social and Political Structures European trade and towns grew throughout the Middle Ages. People kept moving from the country to towns seeking their fortune. Towns required stability to make business and trade more reliable. Stronger monarchies could provide that stability. As a result, towns increasingly became centers of support for monarchies, and monarchies in turn expanded their power. Monarchies gained even more strength after the Hundred Years’ War. For example, the French monarchy no longer had to worry about an English claim to their throne. The French monarchy would eventually become the best example of an absolute monarchy under King Louis XIV (1643–1715). With guidance from skilled councilors, Louis would make France the most powerful nation in Europe. New Ideas For many historians, the end of the Middle Ages began with the development of large nations that had powerful central governments run by kings. As the Middle Ages came to an end, scholars continued the study of classical texts begun by men such as Thomas Aquinas, whom you read about in Lesson 1. New ideas about learning, science, and art developed in Italian cities. The new ideas spread along European trade routes. This new era is called the Renaissance, and you will read more about it in Chapter 13. ESSENTIAL QUESTION 3 How did social and political structures of Medieval Europe change? How did life change during the Middle Ages? More and more people lived in manorsfarmsmountainstowns and supported a monarch rather than local nobility. Increaseddecreased trade spread new goods and ideas throughout Europe, eventually leading to the Renaissance. • During the 14th century, the plague killed about one-third of Europe’s population. • Deadlier weapons were developed during the Hundred Years’ War. • The Hundred Years’ War helped weaken the social and political structures of feudalism. Why It Matters Now . . . In today’s world, our health is still challenged by the spread of epidemic diseases, such as HIV/AIDS. Our security is also challenged by powerful new military technologies, such as nuclear weapons.